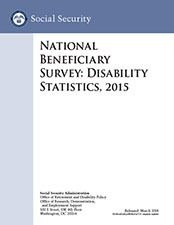 National Beneficiary Survey: Disability Statistics, 2015 provides key descriptive statistics from the 2015 National Beneficiary Survey (NBS), including beneficiary characteristics and health, program and service participation, employment interest and activity, job characteristics, and benefits and employment interaction. The NBS, sponsored by the Social Security Administration's (SSA's) Office of Retirement and Disability Policy, collects data on a wide range of variables not available in SSA's administrative systems. It provides SSA, Congress, researchers, and policymakers with information about key factors that contribute to Social Security Disability Insurance (SSDI) beneficiaries' and Supplemental Security Income (SSI) recipients' successful or unsuccessful employment efforts. Emily Roessel of the Office of Research, Demonstration, and Employment Support prepared this publication. Staff of the Office of Information Resources in the Office of Research, Evaluation, and Statistics edited it and prepared it for publication. Direct any questions, ideas, or comments about the publication to ORDES.NBS@ssa.gov. The 2015 NBS collected data from 4,062 SSDI beneficiaries and SSI recipients aged 18 to full retirement age. Respondents included SSDI workers, disabled adult children, and disabled widow(er)s as well as SSI blind and disabled recipients (throughout the publication we use the term “beneficiaries” to refer to both SSDI beneficiaries and SSI recipients). The survey included beneficiaries from all 50 states and the District of Columbia who were in current-pay status as of June 2014. Data collection began in February 2015 and ended in October 2015. SSA through its NBS contractor, Mathematica Policy Research, conducts the NBS using computer-assisted telephone interviewing (CATI), with computer-assisted personal interviewing (CAPI) for beneficiaries who do not respond to the CATI survey or who request an in-person interview. Whenever possible, the beneficiary is interviewed. If the beneficiary is unable to respond due to his or her disability, a proxy respondent is used. In addition to providing key information on a nationally representative sample of adult beneficiaries, each NBS round typically includes a topical module that focuses on a targeted sample of beneficiaries. The 2015 survey included in-depth, qualitative interviews with 91 SSDI beneficiaries and SSI recipients who have had successful work experiences. A report of those qualitative interviews is available at https://www.ssa.gov/disabilityresearch/documents/Final%20NBS%20Semi%20Structured%20Interview%20Report.pdf. The 2015 NBS data are the latest currently available. We anticipate that data from the 2017 NBS will be available in fall of 2018. More information on the NBS is available at https://www.ssa.gov/disabilityresearch/nbs.html. Documentation, survey questions, and public use data files for the 2015 NBS are available at https://www.ssa.gov/disabilityresearch/nbs_round_5.html. Except where otherwise noted, all statistics are weighted to represent the national adult SSDI and SSI beneficiary population. To avoid disclosing information about particular individuals, cells with one or two responses are suppressed. For percentage distributions, the two lowest values are suppressed.